If you have been using Scrum to develop products, you have probably found that the Scrum Guide only describes the core rules of Scrum, regardless of scale. A lot of companies want to use Scrum to work on multiple products or to develop a comprehensive product that requires multiple teams. The question then arises of how to organize product ownership. Even more common are situations in which the eyes are bigger than the stomach, where the list of features is much longer than their current team can deliver and where companies need to scale to multiple teams to deliver more items of the backlog within a given timeframe. All of these cases require some form of scaling, but the element which is scaled is different in each of these situations. Yet in all of these cases, dependencies are increased, between teams, between Product Backlog items and sometimes even between different products. Managing these dependencies requires changes in the way people work (processes and people) and this is difficult without the help of supporting tools. Many organizations have been scaling Agile and Scrum for years. And for a long time there was a list of commonly used practices and patterns used in the Agile Community, but nothing fully defined. More recently, scaling frameworks such as SAFe and LeSS have been released. SAFe appears to be a complete methodology that tries to encompass large and complex organizations from portfolio management and budget allocation all the way down to the team organization. On the other hand, LeSS mainly focuses on large development organizations with a single product or product family, while it also includes mandatory organizational changes. Scrum.org has released its vision on scaling in the same succinct way that Scrum is defined, i.e. with the release of the Nexus Guide that introduces the Nexus Framework, as well as the Scaling Professional Scrum course and assessments. The course introduces the Scaled Professional Scrum practice library. The iterative and incremental approach to scaling is what makes Nexus stand out from the alternatives. The Nexus framework strongly emphasizes technical excellence in order to scale Scrum sustainably, recognizing that many people who use Scrum are still having trouble delivering a Done increment of working software as one team. Obviously, things only get worse when scaling up, when more teams are involved. Personally, I am much more comfortable with this empirical approach of technical excellence than any big-bang scaling effort which tries to change the tools, technology, teams and organization all at once. Microsoft has developed a Scrum template in the past, and the Agile experience in Visual Studio Team Services has recently been revamped. Most of these new agile features have also shipped as part of Team Foundation Server 2015 update 1. In this article we will focus on the way in which Nexus relates to Scrum and then look at some of the challenges experienced by teams and how tools such as Visual Studio Team Services can support them. In order to scale Scrum, the creators of Nexus stayed away from a prescriptive approach to scaling, because experience shows that no single solution to Scrum, let alone at scale, works in every possible environment, not even within the same organization. Over time, and with every release of the Scrum Guide since 2010, Scrum has been simplified by removing things that were too prescriptive. No scaling method or process should undo those simplifications. This is why it shouldn’t be a surprise that Nexus is a lot like Scrum. As Ken Schwaber, co-creator of Scrum.org describes it, Nexus uses Scrum to scale Scrum. Nexus focuses on complex product development in which multiple teams work on the same product or product family. When working on one product with one or two teams, Scrum suffices and the overhead of a scaling framework doesn’t add value, it may even do harm. When working with multiple products and multiple teams, each product can use Scrum or Nexus to manage their product development, in addition, portfolio management may be required for budgeting and prioritization across products, projects and other investments. However, Nexus does not cover this topic. The different types of scaling problems. Nexus does not attempt to resolve the challenge of an Agile organizational transformation, nor does it resolve the common situation in which one team tries to balance its capacity across multiple products at the same time. It provides a simple framework in which multiple teams can learn how they work best together on one or several products. To better understand how Nexus is an extension of Scrum, let’s look at the differences and similarities between Scrum and Nexus. Scrum is a Framework, and it can encompass many good agile practices. Practices that work for one product and one organization may work differently for other products and organizations. Nexus is a Framework, and to make it work, it needs to be extended with good agile practices. Practices that work for your product and organization may be different than those of another organization. Due to the added complexity of working with multiple teams, these practices are even more important. Scrum focuses on teams of 3-9 people. Fewer people don’t need the overhead of scrum. More people cause communication to break down. 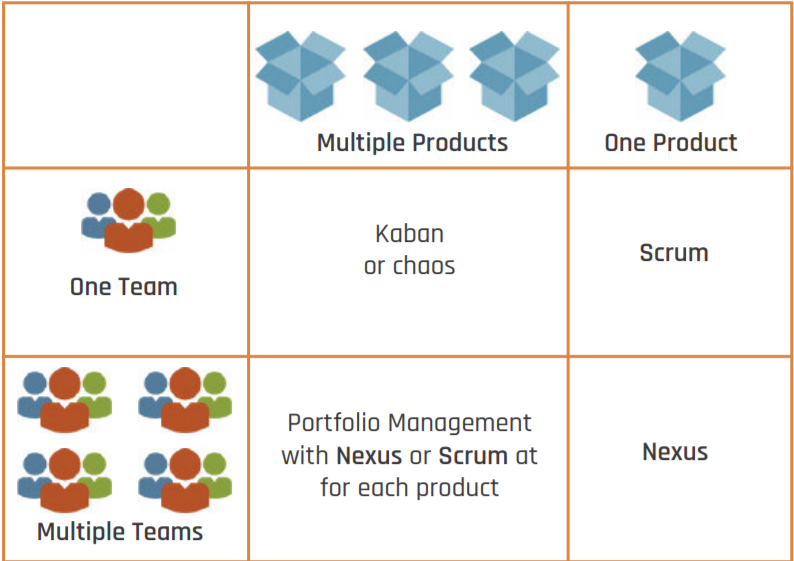 Nexus focuses on 3-9 Scrum teams, which as a whole are referred to as the Nexus. Fewer teams don’t really need the overhead of a scaling framework. More teams will be unable to work together effectively. A Scrum Team has all the skills required to deliver an increment of working software. A Nexus consists of teams who have the skills required to deliver an increment of working software. Nexus allows for the existence of component or layer teams, but all work done in the Sprint across all teams must be integrated and deliver value together. A Scrum Team works on a single Product. A Nexus works on a single product or product family. A product has a single Product Owner, though some responsibilities may be delegated to the teams. A product has a single Product Owner, though he may delegate some of his responsibilities to the teams. A Scrum Team delivers an integrated increment of working software every Sprint A Nexus delivers an integrated increment of working software every Sprint. Sprints are 30 days or less. Sprints are 30 days or less. The main events of Scrum are Sprint Planning, Daily Scrum, Sprint Review and Sprint Retrospective. They are contained in a Sprint. The main events of Scrum are Sprint Planning, Daily Scrum, Sprint Review and Sprint Retrospective. They are contained in a Sprint. The main events of Nexus are the same as those in Scrum with the addition of Product Backlog Refinement as a new timeboxed event. Most events are extended to handle cross-team interaction, indicated by the addition of a Nexus component. So there’s a Nexus Sprint Planning, Nexus Daily Scrum etc. The main artifacts of Scrum are the Product Backlog, Sprint Backlog and the Increment. 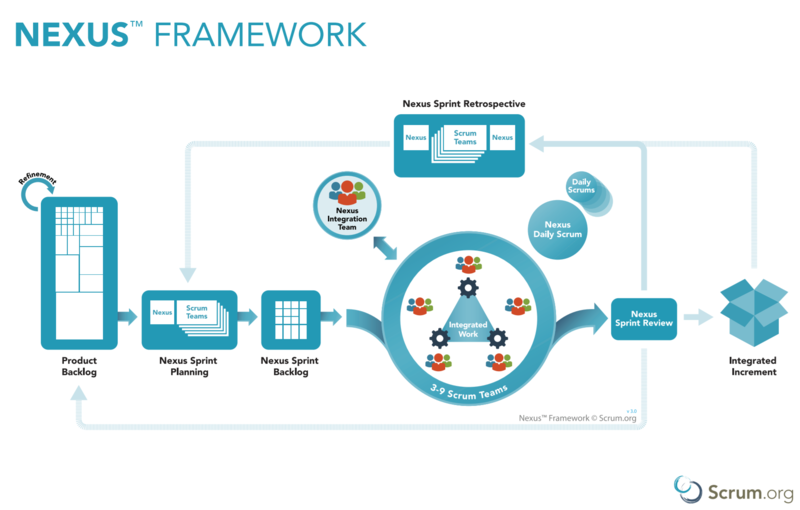 The main artifacts of Nexus are the same as those in Scrum, with the addition of the Nexus Sprint Backlog, which shows the dependencies between the Sprint backlogs of the individual teams. The Product Owner, Scrum Master and Development Team are the only roles that exist in Scrum. Nexus adds a Nexus Integration Team (or NIT) which consists of the Product owner and those members of other teams required to facilitate integration. Even graphically Nexus looks remarkably similar to Scrum, which makes it easy to understand for organizations that have been applying Scrum for some time now. You can see the word Nexus popping up a number of times, usually just before or just after a standard event. Scrum Team and Development Team - unchanged. The Scrum Team still consists of a Product Owner, a Scrum Master and a Development Team, consisting of people with all the skills required to deliver the work required. Product Backlog – Unchanged. It is still a single ordered list of Product Backlog items owned by a single Product Owner. Product Backlog Refinement is introduced as an official event. It happens during the Sprint and there may be multiple events (sometimes in parallel) to which teams send one or more team members. It is important that these events are attended by the right representatives from the individual teams. One of the primary goals of these refinement events is to see how work can be broken down or combined to remove dependencies between teams. Sprint – Unchanged. It is still a time-box in which all the events of Scrum and Nexus take place. Sprint Planning is extended. Before teams start their Sprint, the Product Owner shares the vision and the primary goals for the next Sprint. Delegates from each team come together to discuss Product Backlog items that are mutually dependent. Afterwards, each team launches into a normal Sprint planning meeting, so all teams plan their Sprints at the same time. This works best when all teams are in the same room, although this is not mandatory. This combined event is called the Nexus Sprint Planning. Each team still has its own Sprint Backlog to ensure that all work is transparent within the teams. One additional artifact is created, the Nexus Sprint Backlog. This shows the Product Backlog items each team will work on during the Sprint. It also visualizes the dependencies between these items and teams. The Nexus Daily Scrum happens on a daily basis, and takes place before each individual team meets in their Daily Scrum. In the Nexus Daily Scrum delegates from all teams come together to flag any impediments or dependencies from other teams that will impact the plan for the next 24 hours. The primary source of inspection of a Nexus Daily Scrum is the state of integration of the work of the Nexus. All work that’s been done, i.e. work that is fully integrated across all teams and delivered as an integrated Increment of product, is presented at the Nexus Sprint Review for feedback. All teams deliver this review together. There are no individual Sprint Review events. The Sprint ends with the Nexus Sprint Retrospective, during which all teams together discuss how the Sprint went at the Nexus level and which things may need to be improved. The outcomes are taken into the Sprint Retrospectives of the individual teams. At the end all teams come together to share changes to their process, team or tools, and share anything that might be useful for the teams. Nexus introduces one new “virtual” team, the Nexus Integration Team. Its role in the Nexus is to facilitate collaboration and integration across the teams, and remove impediments at the Nexus or organizational level. The team is made up of the Product Owner and the “right selection” of team members from all Scrum Teams. Its composition may change over time, as the problems they try to solve changes. Nexus assumes that the Scrum Teams will know how to solve the problems they are facing and how to best implement the work on the Product Backlog. It does not provide prescriptive guidance on how to conduct a Sprint Planning meeting with 9 teams, nor does it specify how to remove dependencies between teams. This is where Scaled Professional Scrum provides building blocks to extend the Scrum framework to the level of 3-9 Scrum Teams developing and sustaining one product. The main reason why Nexus can be explained in only 10 pages is also the reason why Scrum.org is developing Scaled Professional Scrum (SPS). Nexus provides a framework that shows how to work together and how to improve incrementally. Scaled Professional Scrum is a library of practices that have been proven in the field in different situations. It also includes practical guidance and a two-day workshop to gain hands-on experience. You may compare it to the good old Gang-of-Four Patterns and Practices book. If you use Nexus and Scaled Professional Scrum, you will discover what is the best way to scale Scrum for your organization. You can test your knowledge of Nexus, Scrum and common scaling practices by taking the Free Nexus Open assessment. Certification can be achieved by passing the Scaled Professional Scrum assessment. We have observed how even one Scrum Team often has a hard time producing a releasable increment at the end of each Sprint. This becomes exponentially more difficult when you are integrating and testing work that needs to happen across multiple teams, at least every month, or less frequently. Most agile practitioners, coaches and trainers will swear by physical boards, and actually holding sticky notes in their hands. Indeed, it changes the level of involvement of people, and it may give them a feeling of accomplishment when physically moving a task or PBI to Done. Yet when working with nine teams, especially if they’re not all in the same location, it is unlikely that teams can be effective with physical boards only. It has become common to work together remotely, in different time zones or have team members working part-time for the company, tools and technology become extremely important for providing the required support to deal with these collaboration issues. While the physical world works best to facilitate communication, collaboration and knowledge sharing, technical practices such as Source Control, Continuous Integration and automated testing help teams to work together and integrate at a technical level. Any team who has used these tools is unlikely to go back. Let’s take some of the most common scaling challenges and look at how people, processes and technical practices can help us ‘resolve or reduce these. The first way to resolve dependencies between teams is to proactively identify them, and try to work around them. This is why Nexus introduces Product Backlog Refinement as an official Scaled Professional Scrum is a library of practices that have been proven in the field in different situations. When working with multiple teams, Refinement is no longer an optional activity. Instead, it becomes a crucial forward-looking event. Refinement is not about writing User Stories and acceptance criteria; it is about figuring out which dependencies exist in the current Product Backlog and how to reduce or completely remove the dependencies. The means to do so may include knowledge exchange, shared code ownership, rewriting Product Backlog items or decomposing or splitting functionality. To reduce dependencies between teams and increase their autonomy, it helps to have teams that are able to work independently in defined areas of the product you’re building. At a higher level, the Product Backlog is an ordered list of items. To ensure that the Product Backlog does not become fragmented, it is important to assign work to teams only just before or at the start of each Sprint. If you don’t, you will end up with one Product Backlog for future work and a Product Backlog for the work each team has claimed. This is detrimental to transparency. It will be very hard to see how work on one team’s backlog relates to that of another team, and it may be that more valuable work is delayed when one team is delivering faster than another. In many tools, including Visual Studio Team Services, it is easy to lose the grand overview of the backlog when work is preassigned to Sprints and teams. Visual Studio Team Services provides some good alternatives: it is better to rely on the Forecasting capabilities to identify which work will be delivered in a future Sprint combined with Tagging so teams can pre-emptively volunteer for specific items on the Product Backlog. Visual Studio Team Services also provides integration with tools such as HipChat and Slack, which helps teams communicate quick status updates and find answers to questions from other teams more effectively. These digital channels make it easy to share links to Product Backlog Items, Build artifacts, etc. When working on a large product in short Sprints it is easy to spend most of the Sprint’s time on testing, or to simply not run all tests during each Sprint. Defects may sneak into areas of the product when it is least expected, causing teams to accumulate technical debt, often unknowingly. Testing is essential to deliver a fully integrated increment of working software. It should be part of every team’s definition of Done and should thus be performed every Sprint. Testing is an important strategy to identify unwanted dependencies that were not caught proactively. The only way to prevent a manual test-avalanche, and omitting important tests, is automation. Automation can be applied at multiple levels, and Continuous Integration will ensure that the sources build, while running the unit tests will ensure that no breaking changes are introduced. Automated deployment to test environments for automated integration and system test ensures that components will work together as expected. With complex environments, it may also be required to automate the provisioning of such environments. Visual Studio Team Services provides Build, Test and Release Management features that can help your teams with these continuous integration problems. In a Nexus you’ll have an absolute minimum nine people, three Development Teams, each consisting of three members, and up to nine Development Teams, each consisting of nine members (81). Six teams of six people might be an optimal size (36). Obviously, the Scrum Masters and Product Owner need to be added to this number. Effective meetings with such large groups are impossible or at best incredibly expensive for any given organization, unless this is facilitated effectively. This is why most Nexus events are attended by representation from each team. It is extremely important that the right people are selected to represent a team. Sending the Scrum Master or the team lead may not be the most effective way to smooth dependencies or resolve issues between teams. Instead, sending the person who has the most knowledge about the subject may be required. Some coordination around stakeholder communication and sharing of the outcomes of such meetings may be required to prevent a stakeholder from being overloaded. Tools such as Visual Studio Team Services can help capture the outcomes of such meetings as Product Backlog items and Acceptance Criteria, but it may not be enough to just capture the information in a tool. The most effective way of communication remains face-to-face. The shared Nexus Sprint Review is hard to maintain as an effective and valuable meeting for all people attending when each team does a show-and-tell of their individual work performed during the last Sprint. Many teams have found that a “Science Fair” or “Open Space” format works well. In these cases, teams generally start with announcements and an explanation of the agenda. Each team then presents its Done functionality and receives feedback in multiple parallel slots, allowing stakeholders to attend the topics most valuable to them. Since meetings are most effective when conducted face-to-face and visually, having an open laptop or computer screen can reduce the value of a meeting by being a distraction. Yet, not many people take the time to create sticky notes so they can use free format ways to play with backlog items and tasks. Visual Studio Team Services can still help you make your meetings more interactive and effective though. Extensions such as “Print cards” enable you to quickly transform your digital backlog into a physical one , allowing teams to conduct visual meetings where they can annotate, arbitrarily group, physically split in two items on a board, unbound by process and tools. While the above are some common challenges and practices, you may find yourself in a different situation. Don’t be afraid to experiment, try out new things and continuously try to improve the way you work as an individual, a Scrum Team and a Nexus. Not all organizations are equal and that they don’t have to be in order to scale effectively. Nexus is an effective way to scale Scrum; it was developed by one of the original founders of Scrum. Unlike SAFe (and LeSS in a lesser degree) which enforces a lot of structure and process on organizations, it takes into account that not all organizations are equal and that they don’t have to be in order to scale effectively. It introduces a number of new concepts to help teams collaborate effectively when they grow past a certain size (generally when there are three or more teams), but it tries to limit its prescriptiveness to a minimum. “Scrum is simple, but hard” is an often-heard phrase. Nexus isn’t any different. While the framework is remarkably simple, it’s very hard to carry out complex, creative software development with multiple teams and deliver new, releasable software every 30 days or less. With technical excellence, a focus on continuous improvement and hard work, it is possible though. You will find some great examples to try in the SPS curriculum and there are boundless other great resources for ideas. Nexus as a framework allows me extend it by borrowing some practices from comprehensive methodologies such as SAFe and try them to see how they can be adapted to resolve a team’s challenge. Tools such as Visual Studio Team Services provide a complete environment to support one or more teams to work together effectively. They cover a broad spectrum from work management through to source control all the way through to building and releasing your software to production. Configuring them correctly and using the right features to accomplish the job is paramount to getting the best value. With a little guidance and an empirical approach to applying the tools and practices, amazing results are possible. A simple framework with the support of these comprehensive tools can help you effectively scale your product development from a single scrum team to nine teams, and if need be work around the hurdles caused by distribution across time and place.